RESEAU JADE – 18 years of experience with work in difficult access areas and with the installation of safety systems. RESEAU JADE regroups 3 complementary activities enabling us to provide complete solutions for the safety of work at height. 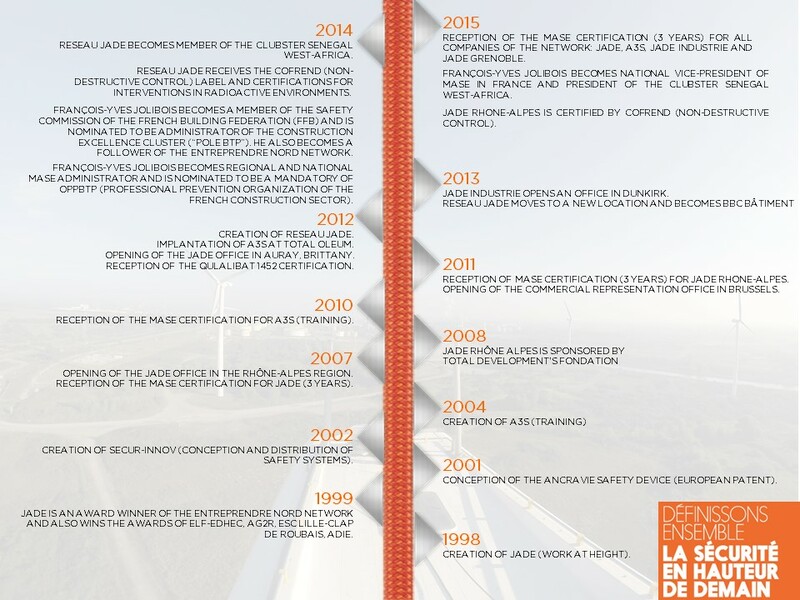 60 specialists of safety at height, bearing the values of RESEAU JADE, graduated and certified, are able to work all over France and in Europe at a competitive price delivering safe and high quality work results. Our qualified, certified and graduated employees have the whole range of construction and industrial maintenance skills for all kind of work at height. Our global offer enables our clients to develop their own competencies and know-how following the trainings provided by our employees with specific on-the-field experiences (audit, control, management are part of the expertise that we provide). RESEAU JADE conceives, distributes and sells innovative safety systems of the most important brands of collective and individual protection.